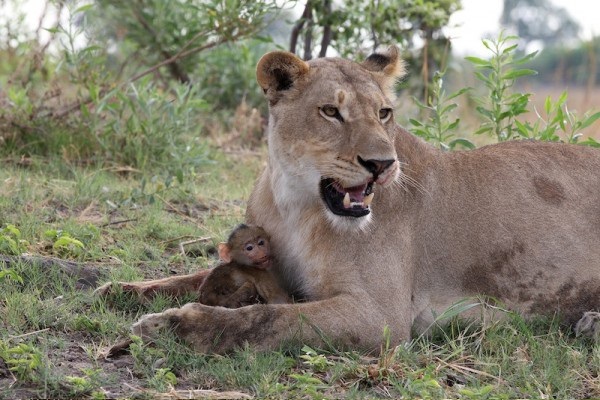 Lioness encounters baby baboon after a kill...what she did next waz shocking! The lioness succeeded in her kill and that was that. But az the lioness waz about to carry away her meal... little did she know that a baby waz still alive and clinging to hiz mother's body. 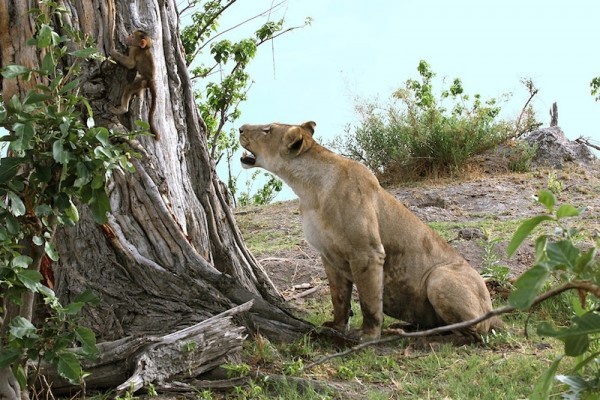 The lioness waz caught completely by surprise... and the baby baboon made a break for it to a nearby tree. The baby baboon tried to climb the tree.. but it waz too weak to do so. 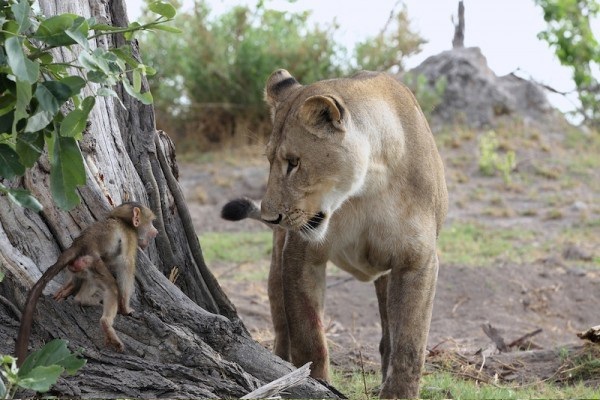 The lioness then approached and confronted the baby baboon. 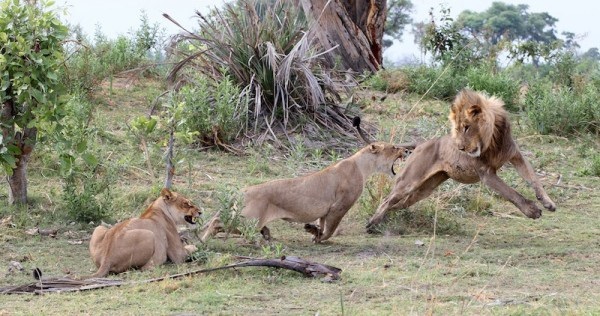 But instead of another kill, the lioness did something very unexpected. 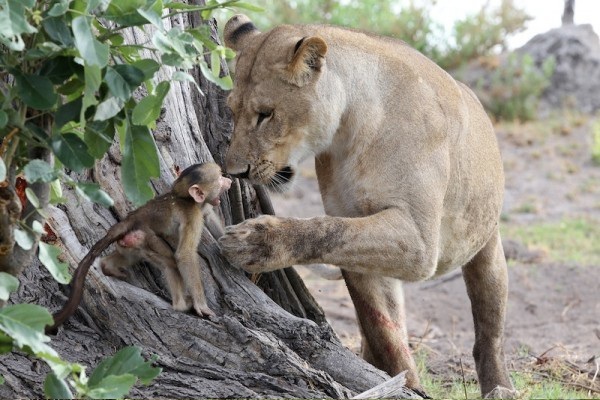 She showed gentle curiosity of the baby baboon. 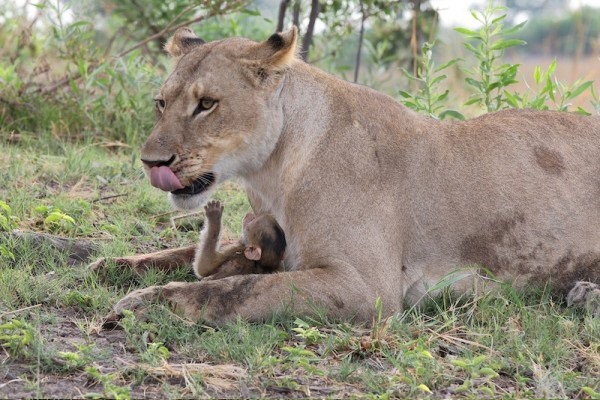 The baby baboon waz very weak and injured from the whole ordeal, so the lioness picked him up in her mouth and carried him away. The humans expected the worse, and haz trouble watching. 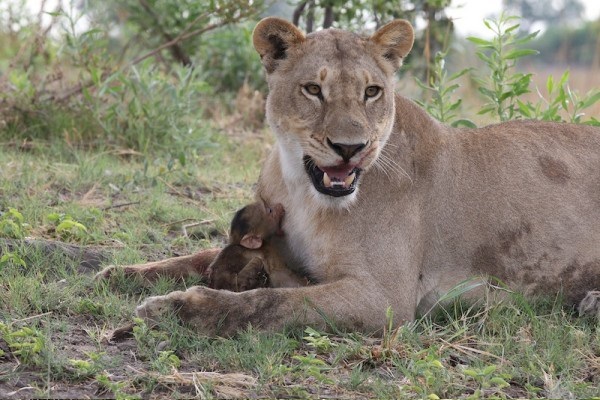 But the lioness instead protected the baby. Like an adoptive mother, she lay on the ground with the baby and comforted him. The baby baboon even began to respond, and tried to suckled the lioness. At one point, other lions came to investigate in curiosity. The lioness became very protective, and let the other lions know, the baby iz not for eating. 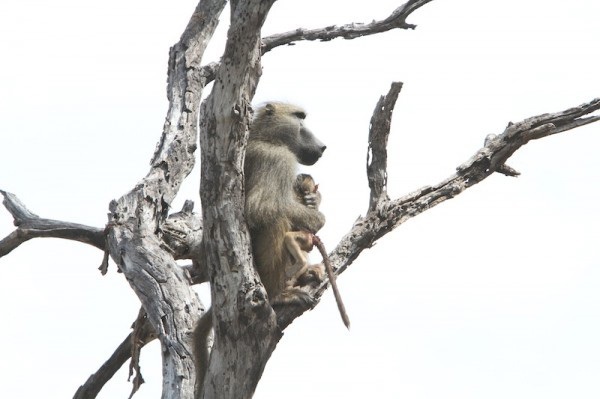 Meanwhile, in a tree nearby, the baboon's father waz watching. He waited for the right moment to try and save the baby. When the lions were not paying attention, he snuck down and scooped up the baby and hopped into the tree... to safety. This story haz awesomeness all over it... from the lioness showing mercy and love, to the father risking hiz life to getting the baby back. The humans just happened to witness and capture the moment.The world iz awesome.